In the dormitory room, each bed has bed curtains, socket, reading light, luggage space and safe deposit box. On the first floor, there are a shared kitchen, a tatami lounge, bathroom and a shower room.You'll see a small garden from the kitchen and cherry blossoms from the lounge in spring. You can relax in a shared kitchen, make a drip coffee and Japanese tea by yourself, and chit-chat with other guests. We will help your trip with some local information. There are sushi restaurants, cafes, Japanese eateries, bakeries, convenience stores in our neighborhood. We rent a bath towel for 100 yen, and a bike for 500 yen a day. You may use our washing and dryer machine for 500 yen include washing liquid. You will spend cozy and relaxed time! This is an old style Japanese house, recently restructured, with tatami in most rooms and wooden floors in the remaining spaces. The owner is kind and helpful, everything is clean, there's a good social, intimate atmosphere even if it's lights out at 23. 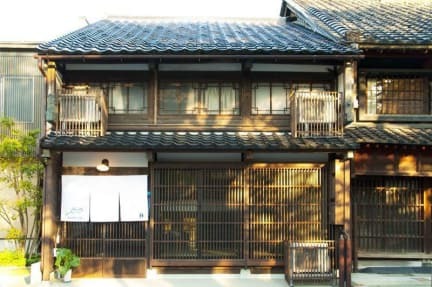 The guesthouse itself is 30 seconds away from the castle/Kenroku-en area, 60 seconds away from the fish market, and offers a bike renting service. I would definitely stay there again and Kanazawa is a little gem. Definitely a great value.